When a student attending Heidelberg’s historic university (established in 1586) had one too many beers at one of the many pubs in town, and when he sang too loudly in the quiet lanes leading back to his room as a result he just might end up paying a penalty by having to spend a week or so in the student ‘jail,’ or ‘Studenten Karzer’ located adjacent to the historic assembly hall. Other offenses which could land the student in jail would be making fun of the constable, tipping over a cow or other foolishness. Now, having to spend time in an open-door environment with a bunch of buddies who had committed various other petty offenses, most having to do with downing too many suds, was not all together a bad thing. In fact, it was a badge of honor to have been a convicted student. Those who spent too much time in the bar and therefore were sent behind bars left behind graphic depictions of themselves, their antics and their mottos behind for us to enjoy a century later. 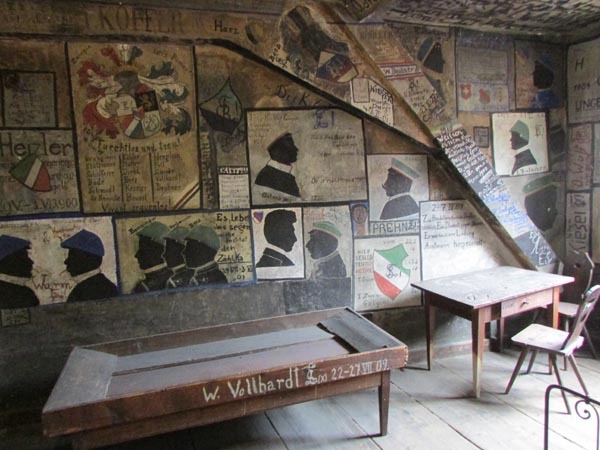 Walls in the ‘jail’ of Heidelberg University are covered with drawings done by those incarcerated here. Students could still attend classes unless they were simply too tired from discussing politics and such with their fellow inmates the night before. Sometimes beer was brought in for the convicts. Posted in Germany Tours and tagged heidelberg, jail, student.